The town of Hanford was dismantled to make way for the reactors that would manufacture the plutonium for Fat Man. 300 people had 30 days to get out. And the town would be no longer. There is no date given for photo of the painting. As it isn’t numbered in the way many of the old WWII photos from Hanford are numbered, I’m going to assume this is post WWII, late 40s or early 50s. No information on the artist is provided, of course, and no information on the purpose of the painting…except for the keyword “safety”. A Hanford Hotel did once exist. I was able to find a reference to it in an old, 1913 government document on water resources in southeastern Washington state. In the document, mention was made of a well at the Hanford Hotel. 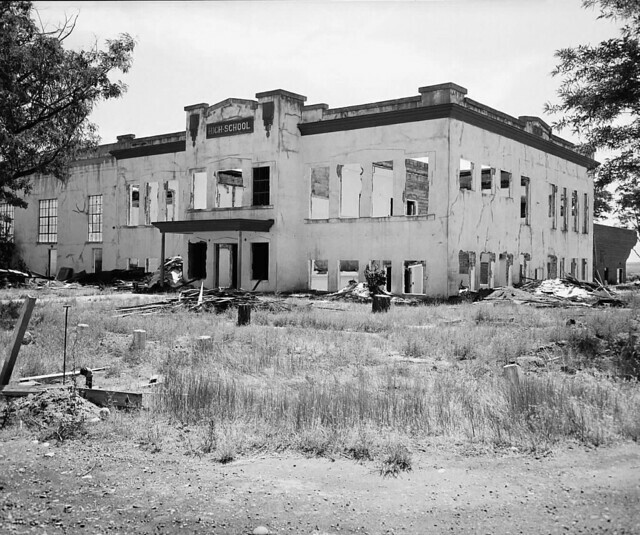 All that has long since remained of the town of Hanford is a shell of its high school. It looked like this in 1954. And it looked like this in 1965. Or part of it did. 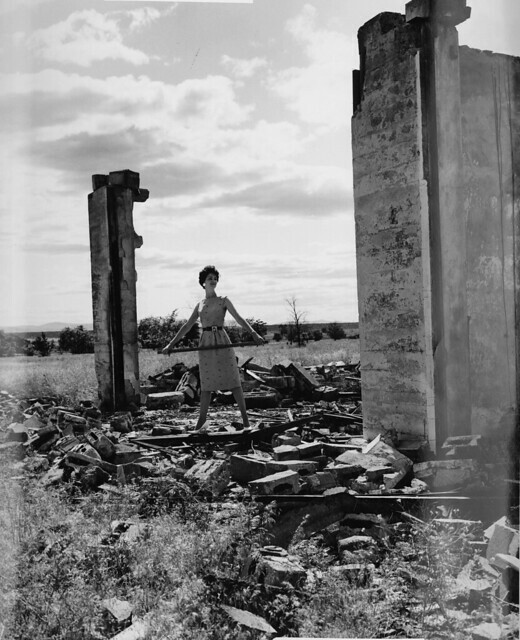 Was it intentional that the model look as if she was standing in the remains of a bombed out building? The old high school, in the angle pictured above, bears an eerie resemblance to Nagasaki’s Urakami cathedral after Fat Man. 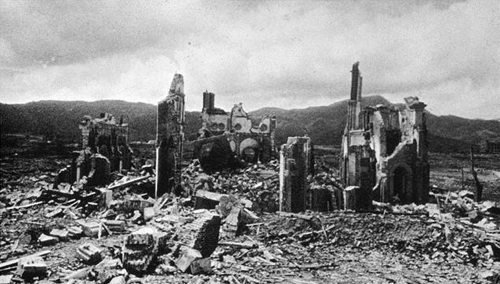 The above photo of Urakami Cathedral is from the Children of the Atomic Bomb website, which is a research website project developed by Dr. James N. Yamazaki, an emeritus professor of medicine at UCLA. He was the lead physician of the 1949 U.S. Atomic Bomb Medical Team, studying the effects of nuclear bombing on children in Nagasaki, Japan. He received the Socially Responsible Medicine Award from Physicians for Social Responsibility in 2008. This website provides the who, what, and why of UCLA’s involvement with the development of the atomic bomb and nuclear issue for over six decades. The consequences of the nuclear age — and nuclear weapons — on human beings and their environment is perhaps the greatest single threat to all of us today. The nuclear threat affects all nations — among them, the U.S. and Russia, the two nations who possess the most weapons of mass destruction — as well as those nations who do not. The University of California at Los Angeles — its scientists, engineers, physicians, and laboratories — has had a long-standing and unique involvement with the development of the nuclear bomb and of the Nuclear Age. Here again is the link to Children of the Atomic Bomb. Lesson plans are available on the site for teaching grades 10 and 11 about the human toll of Fat Man and Little Boy, and working for nuclear disarmament.